There are numerous conversations couples should have before they enter into marriage or cohabitation. One of the more important decisions is about how finances are going to be handled. For some couples, it is an easy decision to have one person in charge of finances. One partner may be better with numbers and money than the other is. One is more knowledgeable about investments and other forms of finance. For other couples, there may be a desire to share financial decision-making. Either way, the financial success of a relationship can depend on an agreement on how financial decisions are made. Similarly, the success of a relationship between investors and advisors can depend on the advisor understanding the financial decision-making dynamic of the investor’s relationship at home. 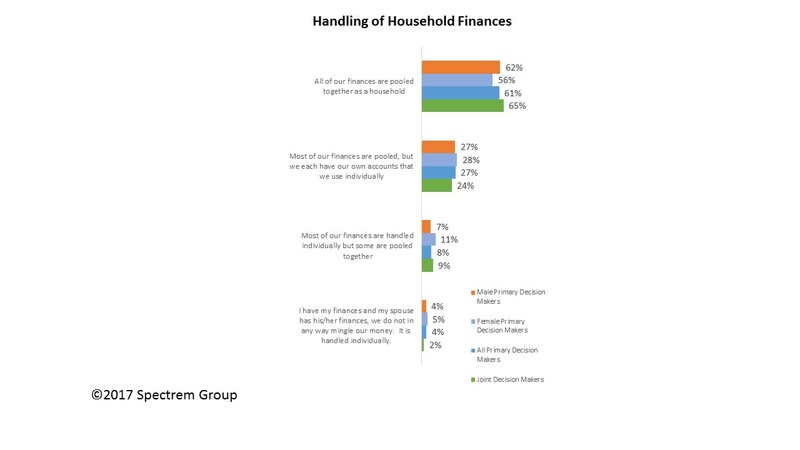 Spectrem’s report Joint Decision-Making Households looks directly at relationships in which two people work together to determine the best path for their finances and investments. It also compares those couples to couples which allow one person to make the financial decisions. From a demographic standpoint, there is little difference between those households which have a primary decision-maker and those households where decisions are made jointly. While age and wealth level do not seem to be a factor, joint decision-makers are more likely retired (55 percent) than are primary decision-makers (47 percent). Generally speaking, households with joint decision-makers are more moderate and less involved in the investing process. Only 42 percent of those investors in a joint decision-making household like to be actively involved with their investments. Only 30 percent of those investors are willing to put a portion of their investments into a risky investment with the aim of receiving a higher return. Those percentages are both well below those of primary decision-makers. Conversely, joint decision-makers are more likely to be looking for a guaranteed rate of return. Fifty-four percent of those households make that claim (although when the primary decision-maker is female, 55 percent of them want the same guarantee). All of this can impact the investor-advisor relationship. Advisors working with joint decision-making households must know they are likely to be less active and more careful with their investment decisions. Another question that advisors must ask investors working tougher on financial decisions is the manner in which household funds are separated or pooled. In 65 percent of households with shared decision-making, all of the household funds are pooled. That is higher than when the male of a households is in charge, and much higher than when a female is in charge. That information will impact conversations between the investors and the advisor, if the advisor is working with investors as a couple. While they may make decisions together for the household, there may be a case where one investor has separate funds he or she wants to invest. Advisors also need to know that when the decision-making in a household is shared, the decisions are made with fewer voices heard. While primary decision-makers are much more likely to seek guidance from friends, family and co-workers, joint decision-makers rely primarily on each other, or have a higher degree of dependence on their advisor to make decisions and investments. If an advisor meets with a married individual without the spouse in attendance, investigating the household financial dynamic is imperative. Advisors need to know how much the absent household member is involved in decision-making, and must address communication requirements when dealing with the household. This is especially true if the absent household member is female; female investors are often concerned that they are overlooked in conversations with advisors. On the other hand, when meeting with couples, advisors can learn a great deal by asking both members questions directly. Deferring to one or the other spouse or household member can put off the investor being ignored, and advisors might not get a real feel for the decision-making process going on at home.